Over the last few years Ukraine has seen its digital markets and innovation scene grow very fast. Ukrainian startups (or startups founded by Ukrainian entrepreneurs), raised $265 million in 2017, up 231% from the previous year. 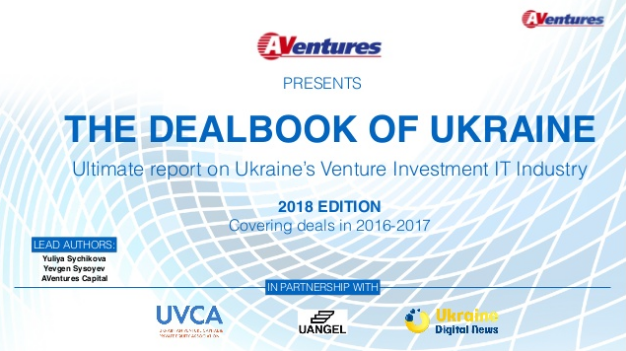 This is one of the key findings of “The Dealbook of Ukraine,” an annual industry report published by AVentures Capital in partnership with local industry associations UVCA (Ukrainian Venture Capital & Private Equity Association) and UAngel, as well as Ukraine Digital News. According to the Dealbook, there were 44 disclosed investment deals in 2017, 90% of which were led by foreign investment funds (i.e. General Catalyst, IVP, Spark, Almaz Capital) with the participation of local funds in the majority of the rounds. The biggest deals of last year involved Grammarly ($110 million from General Catalyst, IVP, and Spark Capital); BitFury ($30 million from Credit China Fintech Holdings); Petcube ($10 million from Almaz Capital, Y Combinator, AVentures Capital, U.Ventures, Digital Future and others); People.ai ($7 million from Lightspeed Venture Partners, Index Ventures, Shasta Ventures, Y Combinator, SV Angel). “The fact that more than $630 million were invested in Ukrainian startups over the past years signals the industry’s resilience amid the country’s economic and political challenges,” said Yevgen Sysoyev, managing partner of AVentures Capital and co-author of the Dealbook. “We are proud that AVentures was the first ever venture capital fund launched in Ukraine and, remains one of the key players in the investment market along with Horizon Capital, Digital Future, TA Ventures and international fund”. The past two years were marked by the entry of Netflix and Uber into the local market; most recently an international consortium launched the preliminary studies for a Hyperloop project in the country, while the $1billion acquisition of video doorbell firm Ring by Amazon illustrated the Ukraine’s excellence in software R&D. The Dealbook also lists the Ukrainian tech startups which grew the most over the past years to become major players in their industries. These companies include Attendify, BPMOnline, Depositphotos, Grammarly, Jooble, Petcube, Readdle, Starwind Software, Zeo Alliance, among others.